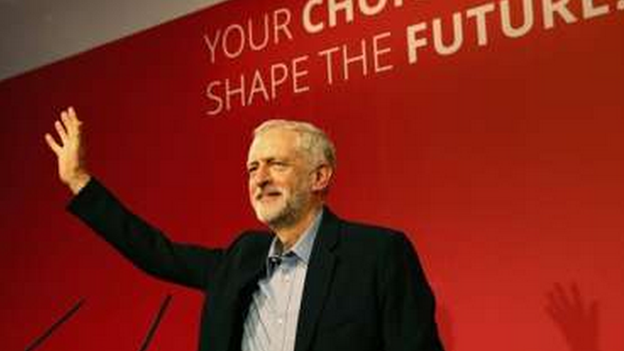 He gained 251,417 or 59.5% of first preference votes - 40% more than his nearest rival Mr Burnham, who got 19%. Ms Cooper was third on 17% and Ms Kendall a distant fourth with 4.5% of the vote. A total of 422,664 people cast a vote - a turnout of 76%. Mr Corbyn was backed by few Labour MPs but he came way ahead of his rivals among party members, trade unionists and those who signed up for to take part for £3. He said the leadership campaign "showed our party and our movement, passionate, democratic, diverse, united and absolutely determined in our quest for a decent and better society that is possible for all." In his victory speech, Mr Corbyn paid tribute to his three defeated rivals, with particular praise for Liz Kendall, the Blairite candidate, who had the most policy differences with him during the turbulent three month campaign. The left winger, who has spent his entire 32 year career in the Commons on the backbenches, promised to fight for a more tolerant and inclusive Britain - and to tackle "grotesque levels of inequality in our society". The Islington North MP said his first action as Labour leader would be join a demonstration with refugees. He also made clear that his first day in Parliament as leader will see him oppose the government's efforts "to shackle unions in the Trade Union Bill which they are bringing forward on Monday". Shadow health minister Jamie Reed, who has been an outspoken critic of Mr Corbyn, announced his resignation from the Labour front bench within second's of Mr Corbyn's victory. Unite leader Len McCluskey said: "Unite members were among those who took part in their thousands, enthused by the chance to engage in a genuine debate about what and who Labour stands for, and the sort of nation we want modern Britain to be."